For the moth genus, see Argyria (moth). Not to be confused with agyria. The terms argyria and argyrosis have long been used interchangeably, with argyria being used more frequently. Argyrosis has been used particularly in referring to argyria of the conjunctiva, but the usage has never been consistent and cannot be relied on except where it has been explicitly specified. Medical authorities do not recommend colloidal silver, because of its lack of proven effectiveness and the risk of side effects. In animals and humans chronic intake of silver products commonly leads to gradual accumulation of silver compounds in various parts of the body. As in photography (where silver is useful because of its sensitivity to light), exposure of pale or colourless silver compounds to sunlight decomposes them to silver metal or silver sulfides. Commonly these products deposit as microscopic particles in the skin, in effect a dark pigment. This condition is known as argyria or argyrosis. Chronic intake also may lead to silver pigments depositing in other organs exposed to light, particularly the eyes. In the conjunctiva this is not generally harmful, but it also may affect the lens, leading to serious effects. Localised argyria often results from topical use of substances containing silver, such as some kinds of eye drops. Generalized argyria results from chronically swallowing or inhaling silver compounds, either for medical purposes, or as a result of working with silver or silver compounds. While silver is potentially toxic to humans at high doses, the risk of serious harm from low doses, given over a short term, is slight. Treatment of external infections is considered safe; oral use of colloidal silver is safe for short term administration if the dose is low. Silver is used in some medical appliances because of its anti-microbial nature, which stems from the oligodynamic effect. Chronic ingestion or inhalation of silver preparations (especially colloidal silver) can lead to argyria in the skin and other organs. This is not life-threatening, but is considered by most to be cosmetically undesirable. The reference dose, published by the United States Environmental Protection Agency in 1991, which represents the estimated daily exposure that is unlikely to incur an appreciable risk of deleterious effects during a lifetime, is 5 µg/(kg·d). Argyria worsens and builds up as exposure to silver continues, and does not resolve once exposure stops. Since at least the mid-19th century, doctors have known that silver or silver compounds can cause some areas of the skin and other body tissues to turn grey or blue-grey. Argyria occurs in people who ingest or inhale silver in large quantities over a long period (several months to many years). People who work in factories that manufacture silver can also breathe in silver or its compounds. In the past, some of these workers have become argyric. However, the level of silver in the air and the length of exposure that caused argyria in these workers is not known. Historically, colloidal silver, a liquid suspension of microscopic silver particles, was also used as an internal medication to treat a variety of diseases. In the 1940s, they were overtaken by the use of pharmaceutical antibiotics, such as penicillin. A prominent case from ingestion of colloidal silver was that of Stan Jones of Montana, a Libertarian candidate for the United States Senate in 2002 and 2006. The peculiar coloration of his skin was featured prominently in media coverage of his unsuccessful campaign, though Jones contended that the best-known photo was "doctored". Jones promised that he was not using his silvery complexion as a gimmick. He promoted the use of colloidal silver as a home remedy. He said that his good health, excepting the unusual skin tone, is the result of his use of colloidal silver. 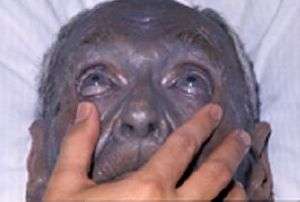 In 2007, press reports described Paul Karason, an American man whose entire skin gradually turned blue after using colloidal silver made by himself with distilled water, salt and silver, and using a silver salve on his face in an attempt to treat problems with his sinus, dermatitis, acid reflux and other issues. Karason died on September 23, 2013 after suffering a heart attack and stroke, which were unrelated to his skin discolouration. Rosemary Jacobs is a prominent activist against alternative medicine. As a child, Jacobs was treated for allergies with nose drops that contained colloidal silver, and developed argyria as a result. Jacobs came to international attention after Paul Karason was on The Today Show in 2008. From 2010 to 2013, Jacobs posted about topics in health fraud, particularly naturopathy, on her blog. Although research is still not definitive, the literature has suggested that argyria can cause a decrement in kidney function. Additionally, a lack of night vision may be present. The lack of night vision would most likely be due to damaged rods in the eye, from the exposure to silver or silver dust particles in the ocular region. ↑ James, William D.; Berger, Timothy G.; Elston, Dirk M.; Odom, Richard B. (2006). Andrews' diseases of the skin: clinical dermatology. Saunders Elsevier. p. 858. ISBN 0-7216-2921-0. OCLC 62736861. 1 2 3 4 Fung MC, Bowen DL (1996). "Silver products for medical indications: risk-benefit assessment". Journal of Toxicology. Clinical Toxicology. 34 (1): 119–26. doi:10.3109/15563659609020246. PMID 8632503. ↑ "Over-the-counter drug products containing colloidal silver ingredients or silver salts. Department of Health and Human Services (HHS), Public Health Service (PHS), Food and Drug Administration (FDA). Final rule". Federal Register. 64 (158): 44653–8. August 1999. PMID 10558603. 1 2 Lansdown AB (2006). "Silver in health care: antimicrobial effects and safety in use". Current Problems in Dermatology. Current Problems in Dermatology. 33: 17–34. doi:10.1159/000093928. ISBN 3-8055-8121-1. PMID 16766878. ↑ Brandt D, Park B, Hoang M, Jacobe HT (August 2005). "Argyria secondary to ingestion of homemade silver solution". Journal of the American Academy of Dermatology. 53 (2 Suppl 1): S105–7. doi:10.1016/j.jaad.2004.09.026. PMID 16021155. ↑ London Medical Gazette: Or, Journal of Practical Medicine. 1843. pp. 791–. Retrieved 13 July 2013. ↑ The Cincinnati Lancet and Observer. E.B. Stevens. 1859. pp. 141–. Retrieved 13 July 2013. ↑ "Why This Man Turned Blue". Today. NBCNEWS.com. 7 January 2008. Retrieved 19 November 2015. ↑ Jacobs, Rosemary (1998). "My Story". Rosemary's Story. Retrieved 19 November 2015. ↑ "Woman who turned silver warns of dangers of internet medicines". The Telegraph. 5 September 2008. Retrieved 19 November 2015. ↑ Hitti, Miranda (5 September 2008). "Facts About Argyria, the Gray Skin Condition Rosemary Jacobs Blames on Colloidal Silver". WebMD. Retrieved 19 November 2015. ↑ Jacobs, Rosemary. "Rosemary's Medical Blog". Retrieved 19 November 2015. Rosenman, Kenneth D., A. Moss, and S. Kon. "Argyria: clinical implications of exposure to silver nitrate and silver oxide". Journal of Occupational and Environmental Medicine 21.6 (June 1979): 430–435. CDC Public Health Statement for Silver. 1990 alert from U.S. Centers for Disease Control. Accessed February 24, 2007. "Rosemary's Story." Rosemary Jacobs explains her argyria; includes photographs. Accessed February 24, 2007. "Systemic Argyria Associated With Ingestion of Colloidal Silver." by Akhil Wadhera, MD and Max Fung, MD. Dermatology Journal Online. Accessed February 24, 1997. "Man Turns Blue", by Duncan Hooper, telegraph.co.uk, Dec. 21, 2007. "This Man Turned Blue (video)", NBC Today Show, Matt Lauer interview, aired January 7, 2008. Chemistry behind the ‘blue man’ unlocked", by Josh Howgego, Chemistry World, 1 November 2012.